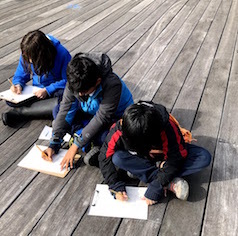 In 2018 we celebrated our 16th year by expanding our name to 'Day in the Life of the Hudson and Harbor' to recognize the wide group of samplers from the lower estuary. 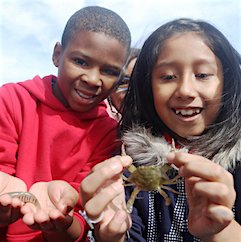 Through the years we have worked with over 50,000 students, teachers and environmental educators studying the river at more than 100 riverfront sites, measuring salinity, chemistry, turbidity, biology and sediments. 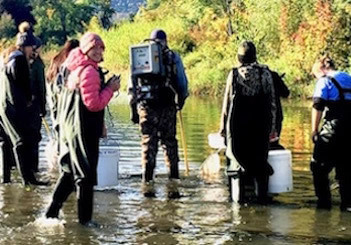 Over 30,000 fish from 79 different species, representing one third of the 228 species documented to data in the Hudson River watershed have been netted! What a whirlwind of learning! To the left is a photo of northern pipefish from salty Ferry Point Park, the most slender fish in the estuary. 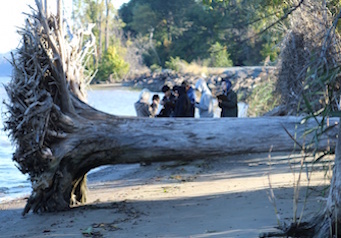 Above are students working with fisheries staff sampling larger fish in a Hudson tributary. 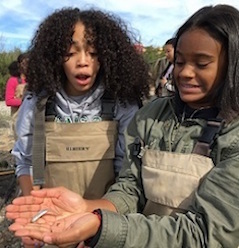 October 16th arrived with a cold snap and significant winds that pushed the tides so far out that wide expanses of mud greeted students in many sampling locations. A totally saturated watershed, soaked from over a month of rain, which in many places represented levels double and even triple thirty year averages, pushed any run off from recent rain events straight into the river. Additionally, a saturated watershed means contributions from groundwater may have also contributed to what was the freshest river we have seen in our 16 years of running this event. Much of the watershed provided water samples with salinities so low that they were below the detecable limits of our sampling (31 ppm). The salt front (100 ppm chloride) was located @~ RM 24 between Piermont and Dobbs Ferry. 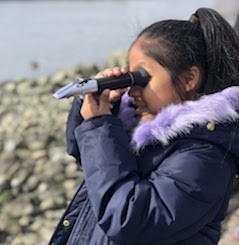 The day surprised lower estuary samplers as the run off from recent rains was enough to override the salty incoming tides, so that in many locations late morning and afternoon sampling on an incoming flood tide posted lower salinities than the morning ebb tide! In addition to affecting the salinity the recent rains had pushed down pH and D.O. in many locations, although strong winds helped offset some of the drop in D.O. levels. All the data shows an active, dynamic system.